Wisconsin Poet Laureate Margaret Rozga. Photo by TJ Lambert of Stages Photography. 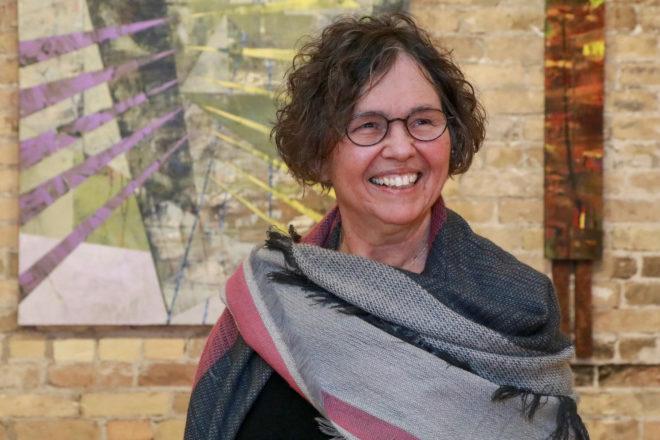 Lifelong Wisconsin resident Margaret “Peggy” Rozga has been named the Wisconsin poet laureate for 2019-20. Rozga, who lives in Milwaukee, is a professor emerita of English at the University of Wisconsin-Waukesha who teaches a poetry workshop for Continuing Education at what is now the UWM-Waukesha campus. As an educator, avid reader and researcher, parent and advocate for social and racial justice, Rozga writes poems that draw on many of these experiences and interests. Her first book, 200 Nights and One Day (Benu Press, 2009), earned a bronze medal in poetry in the 2009 Independent Publishers Book Awards and was named an outstanding achievement in poetry for 2009 by the Wisconsin Library Association. Her three additional collections of poems are Though I Haven’t Been to Baghdad, Justice Freedom Herbs and Pestiferous Questions: A Life in Poems. Rozga served as an editor for three poetry chapbook anthology projects, most recently Where I Want to Live: Poems for Fair and Affordable Housing (Little Bird Press, 2018), a project commemorating the 50th anniversary of Milwaukee’s fair-housing marches. To learn more about Rozga, visit wisconsinpoetlaureate.org.